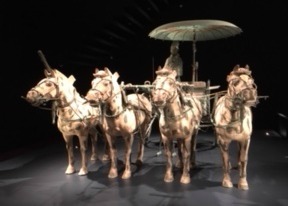 Look below for a review of the Virginia Museum of Fine Arts' "Terracotta Warriors" visiting exhibit, plus an important update on getting free parking. The Virginia Museum of Fine Arts in Richmond is so worth a visit, rain or shine. Like James Madison's home, Montpelier, the museum went through a very lengthy major renovation a few years ago. Unlike Montpelier, which reduced its size by two-thirds, the art museum EXPANDED by more than a third. Having spent five years in New York City (and many hours at the Metropolitan Museum of Art and other world-class art museums around the world)--we have pretty high expectations for art museums. 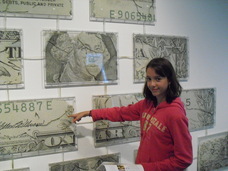 So when we first moved to Virginia we were pleasantly surprised by the Virginia Museum of Fine Arts' collection. 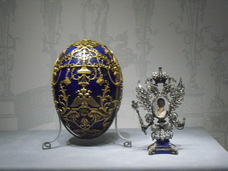 An amazing Faberge egg at the Virginia Museum of Fine Arts' extensive Faberge exhibit. 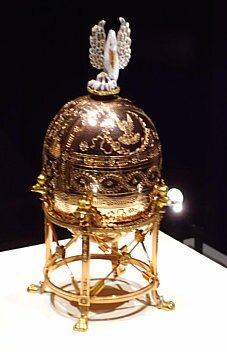 My favorite part used to be quite small: a special room dedicated to their collection of stunning Faberge eggs and other artifacts by Peter Carl Faberge (it was one of the largest permanent collections of Faberge eggs and artifacts outside Russia). Since a traveling Faberge exhibit at the museum a few years ago, they've expanded the permanent exhibit so that it is several rooms, making it one of the most impressive Faberge exhibits in the world. Most were items created by the Faberge company and sold to the Romanov family and other Russian royalty. Composed by gold and other precious metals, brilliant cloisonné, and precious stones, the picture frames, cigarette cases, umbrella handles, and other objets de luxe are breathtaking and meticulously crafted. The highlight for me was (and still is) four Imperial Easter eggs, which were created by Faberge specifically for the last Russian czar, Nicholas II, to give to his wife, Czarina Alexandra, at Easter. All Imperial Easter eggs come on a stand and have a surprise: for example, the Red Cross Egg, so-called because it is white with a red cross to symbolize the international Red Cross, opens up to reveal miniature frames with portraits of the Czarina, two of his daughters, and other family members in nursing uniforms. While the Virginia Museum of Fine Arts' Egyptian and Asian collection isn't large, the new museum is so huge, they have a good collection of European and American oils and watercolors, as well as a modern art section that even I enjoy (so you know it must be good!). Off the Virginia Museum of Fine Arts' marbled foyer, they have a nice gift shop, and a rather elegant little café featuring sandwiches, light entrees, espressos, and desserts. (They also have kids fare like grilled cheese and PBJ.) The Best Café is open 10 am-5 pm, and until 8 pm Thursdays and Fridays. If you want to bring your own lunch, you are welcome to eat it in the Best Café, or in the patios outside. For fine dining, the Amuse Restaurant is open daily 11:30 am-5 pm (open til 9 pm Thurs & Fri). I haven't tried it, but I looked at the menu and it looked very gourmet. It was also packed (on a Monday no less) with lots of people in business attire, so it seems to be the new "in" spot to dine. As I mentioned, admission to the Virginia Museum of Fine Arts is free (okay, a suggested donation), which makes it a perfect spot for a family vacation getaway. Visiting exhibitions, which have included paintings by Toulouse-Lautrec, exhibits of Tiffany and Picasso, and Faberge eggs, and selections from the private collection of Queen Elizabeth II, range from $8-$20 per adult. 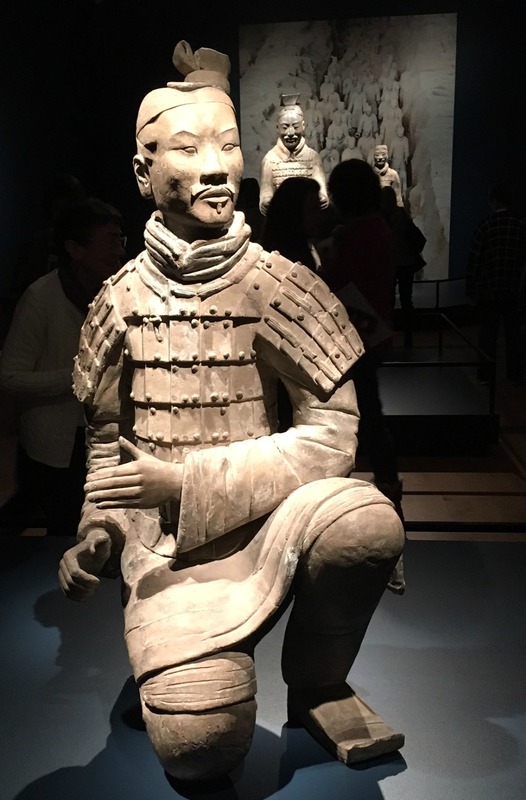 "The Terracotta Warriors" Exhibit Review - Worth it or not? I'm a fan of historical art, particular art which combines archaeology and things long hidden in the ground, so I was initially intrigued at the museum's visiting exhibit. "Terracotta Army: Legacy of the First Emperor of China" (open now through March 11) features 130 works of art, drawn from the collections of 14 art museums and archaeological institutes in China. The highlight of the exhibit is figures from an underground army of nearly 8,000 life-size terracotta figures which were buried to lead Qin Shihuang into the afterlife. One of the terracotta warriors in the "Terracotta Warrior" exhibit. After talking to one of my students who had visited the exhibit, I initially changed my mind about visiting. She told me that she was surprised they had only eight of the terracotta warriors, and that the exhibit seemed "drawn out" with lesser items to make it seem bigger. "For 20 bucks a person?" I thought, "Sounds like a rip off." That changed when I learned that teachers can get free admission to the "Terracotta Army" special exhibit at the Virginia Museum of Fine Arts. Virginia teachers need only show an ID badge at the admissions desk to get the deal. In addition, teachers can also purchase tickets for family members at half price. So we decided to go, figuring that what would normally cost my family of four $60 (admission to the exhibit is $20 per adult, plus $10 for students) would only cost us $20. Artifacts from the "Terracotta Warrior" exhibit. Was it worth it? Uh, not so much-- yes, even at the equivalent of $5 each. I've seen great traveling exhibits at the museum (like the Faberge one a few years ago), but THAT was not a great exhibit. The introductory video, which could have laid the groundwork for what we'd see, was a 3-minute, soundless video which was really lacking, while most of the first few rooms had one or two important items, but the rest consisted of bronze, not-easily-identifiable items or roof tiles. The best part is the room with the statues, but since there are only eight, that was a disappointment too, as well as the lack of almost any info on the rest of the mausoleum complex where they found the soldiers. And don't bother with the official exhibition book. I found more info on Wikipedia. Bottom line: I wouldn't recommend it. Parking for the Virginia Museum of Fine Arts is now $5 per day in the VMFA Parking Deck. I've always advised readers to find free parking in the Virginia Historical Society lot next door, but I guess they discovered my secret, since they now post large signs saying that they'll tow unless you're visiting the Historical Society. So it depends on how gutsy you are. If you really want to save $5, I'd advise you to spend some time in the Historical Society first (it's really worth a visit! 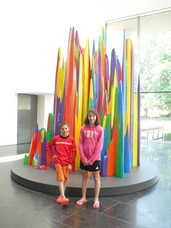 ), then walk over to the Art museum. For other things to do and see in Richmond, like Maymont and the Science Museum of Virginia, click here.